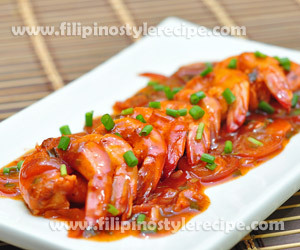 Filipino Style Recipe: Stir Fry Shrimp in Tomato Sauce is a simple yet mouth-watering seafood dish. The dish is consist of shrimp stir fry then cooked in tomato sauce. 1. In a sauce pan, heat olive oil then saute garlic and onion. 2. Add shrimp then cook until bright pink. Remove from the pan and set aside. 1. In a same pan, add tomato then cook until soft. 2. Add tomato sauce and broth then simmer until reduced. 3. Season with salt and pepper according to taste. 4. Add shrimp then cook for another minute. 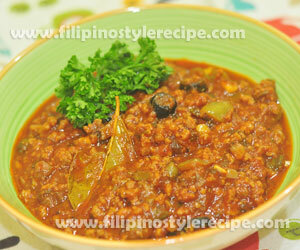 Filipino Style Recipe: Spicy Pork Tomato Meat Sauce is a simple and easy recipe that consists of ground pork cooked in tomato sauce, bell peppers, cumin and olives then season with salt and pepper. Estimated time of cooking: 30 minutes. 1. In a casserole, heat oil then saute garlic, onion and bell pepper. 2. Add ground meat then continue cooking until light brown. 3. Add tomato sauce, water, cumin, bay leaves and parsley then simmer for 8-10 minutes. 4. Add olives, capers, chili flakes, salt and pepper then mix well. 5. Transfer to serving bowl then garnish with parsley. Serve immediately with steamed rice. 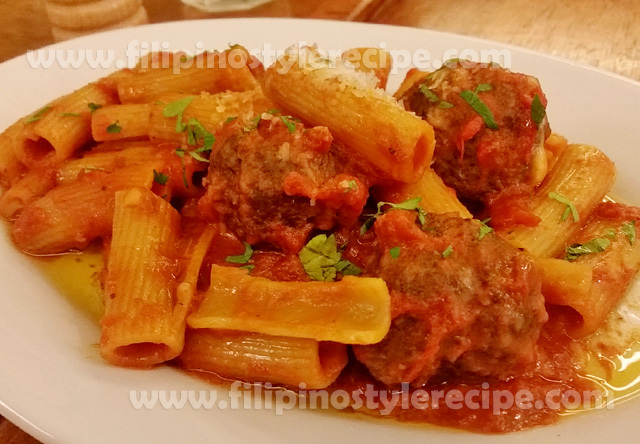 Filipino Style Recipe: Pork Guisantes is a simple yet delicious tomato-based pork dish cooked in tomato sauce together with green peas. This dish can be served together with steamed rice during lunch time. 3. Add fish sauce, bay leaves, water and tomato sauce then simmer in a low heat for 20 minutes or until tender. 4. 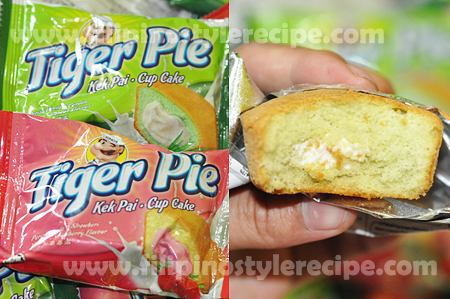 Add green peas, cover and cook for another 2 minutes. Season with salt and pepper. 5. 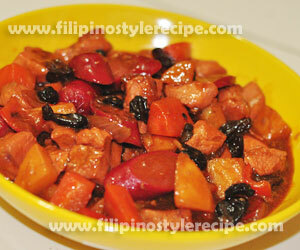 Transfer to serving plate then serve with steamed rice. Enjoy! 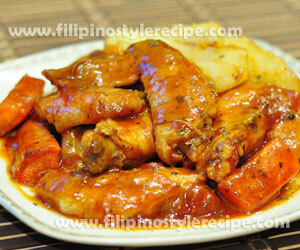 Filipino Style Recipe: Spicy Wings in Tomato Sauce is another mouth-watering dish that consists of a chicken wings cooked in tomato sauce together with potatoes, carrots, herbs and seasonings. 2. In a frying pan, heat oil then fry chicken wings until golden brown. Remove from pan and set aside. 3. In a same pan, fry potatoes and carrots until light brown. Drain and set aside. 1. In a sauce pan, heat oil then melt butter. Saute garlic, rosemary, and tomatoes until soft. 2. Pour chicken stock, tomato sauce, cumin, chili flakes and basil then simmer for 5 minutes. 3. Adjust seasoning with salt and pepper according to taste. 4. Add chicken wings, carrots and potatoes then simmer for another 2 minutes. Filipino Style Recipe: Chicken mechado is another chicken stew that consists of a chicken meat cooked in tomato sauce together with potatoes, carrots and bell peppers then seasoned with soy sauce, bay leaves and vinegar. 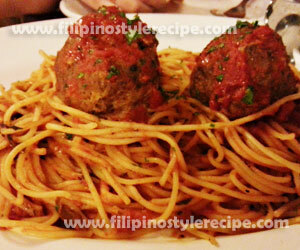 This dish is similar to other tomato-based dishes such as kalderata, menudo and afritada. 1. In a pan, heat oil then fry potatoes and carrots until golden brown. Drain and set aside. 2. Add chicken and fish sauce then continue sauteing until color turns to brown. 3. Pour tomato sauce, soy sauce, bay leaves and chicken stock then simmer until tender. Add water if necessary. 4. Add vinegar and boil again for 2-3 minutes. Do not stir. 5. Add carrots, potatoes and bell pepper then simmer for 3 minutes. 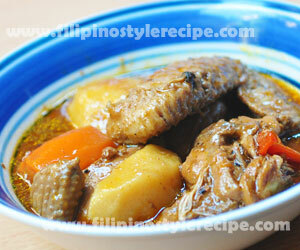 Filipino Style Recipe: chicken menudo is another mouth-watering tomato-based dish. 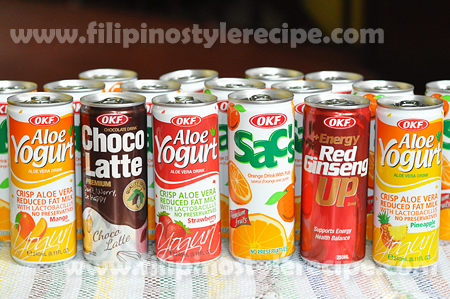 The procedure is almost the same to pork menudo and chicken afritada. The chicken marinated then cooked in tomato sauce together with vegetables and other ingredients. 1. 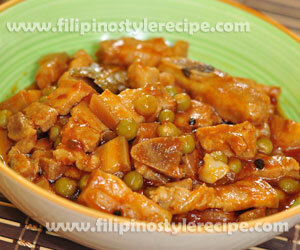 In a large bowl, marinate the chicken in calamansi juice and soy sauce for 15 minutes. Set aside. 2. In a large pot, heat cooking oil and fry potatoes and carrots until light brown. Drain and set aside. 1. In the same pot, reduce oil then saute garlic and onion. 2. Add marinated chicken then stir cook for 3 minutes. 3. Pour water, chicken bouillon and tomato sauce then simmer for 10 minutes or until chicken is tender. 4. Add potatoes, carrots, red bell pepper, raisins, hotdog, sweet peas, bay leaves and liver spread then simmer for 5 minutes. Stir occasionally. 5. 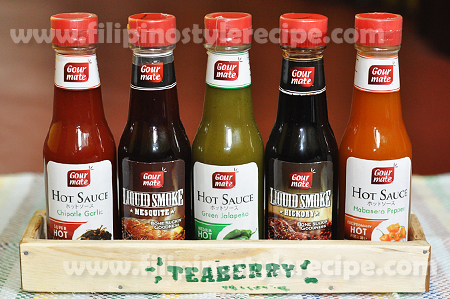 Adjust seasoning with brown sugar, salt and pepper according to taste. 6. Remove from heat then transfer to serving bowl.Serve immediately with steamed rice. 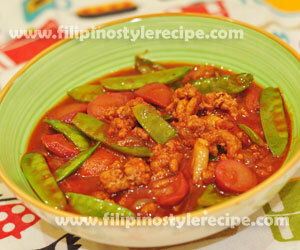 Filipino Style Recipe: Ground pork and snow peas in tomato sauce is an easy, simple and affordable dish. Sauteed ground pork then cooked in tomato sauce together with snow peas and hotdogs. 2. 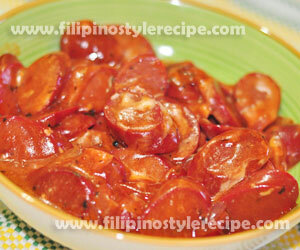 Add hotdogs then stir cook for 3 minutes. 3. Add ground pork, fish sauce and ground pepper then continue cooking until light brown. 4. Pour tomato sauce, water then cover and simmer for 5 minutes. 5. Add pork bouillon and sugar then adjust seasoning according to taste. 6. Add snow peas then simmer for another 3 minutes.